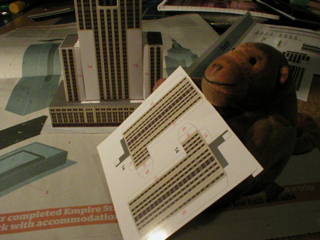 One Saturday morning Mr Monkey found that a 1/100th scale card model of the Empire State Building had arrived with the weekend paper. Unfortunately, his Empire State Building was rather flat - it had to be, to fit through the letter box - and he could see he'd need to get Mr Rik's assistance with the necessary cutting, folding and gluing. 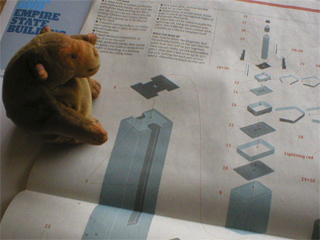 Mr Monkey carefully studied the instructions given in the paper, and read Tim Dowling's account of making the model and how difficult it had been. 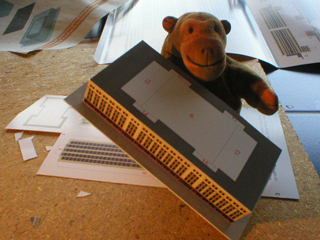 Before getting Mr Rik to start work, Mr Monkey carefully examined all the parts of the model, and worked out how they'd probably fit together. 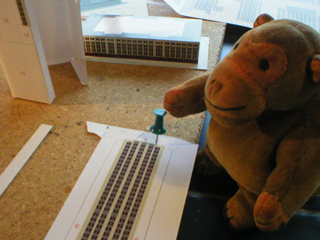 Under Mr Monkey's direction, Mr Rik carefully cut out the parts needed to construct the base of the tower. Mr Monkey helped with the folding, but kept at a safe distance while Mr Rik glued the parts together. He didn't want sticky fur. 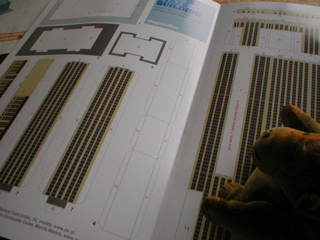 Soon Mr Monkey was able to inspect the beginning of his building. Because of the shape of the Empire State Building sometimes the card had to be folded the wrong way. As there weren't any lines to score on the back of the printed card, Mr Monkey made pinholes in the right places on the front, so that Mr Rik knew where to score and fold afterwards. 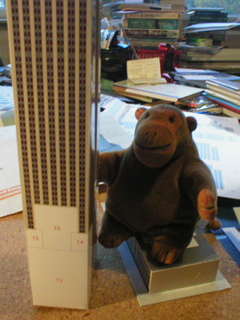 Soon Mr Monkey had a fairly towering part of his skyscraper, almost ready to be glued into place. While Mr Rik constructed the side bits of the tower, Mr Monkey found that base building made a nice seat for a monkey interested in seeing what was going on. 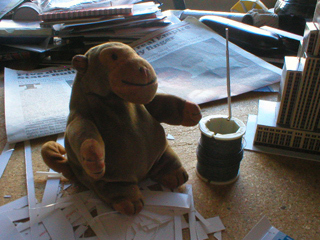 Mr Monkey had to abandon his seat when the main tower was glued in position. There were more bits of wall to add around the bottom of the tower than Mr Monkey had expected, and he made himself useful by moving parts around in a helpful sort of way. Mr Monkey helped as Mr Rik cut the pieces out and folded them and glued them in place. Eventually he had an almost complete Empire State Building, but he couldn't help noticing that the pointy top was missing. 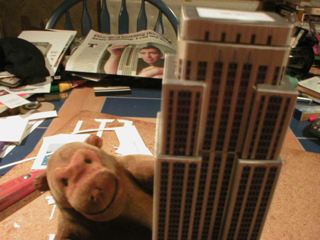 Mr Monkey watched quietly while Mr Rik made the pointy top of the Empire State Building, which would have been a place to moor airships if they hadn't found out they'd be blown about too much. This was the most fiddly and annoying part of the entire building, and Mr Rik might have said some bad words while he was doing it. Mr Monkey found out that the lightning conductor didn't come with the model, so he had Mr Rik make something from paper and plastic rod that looked reasonably like one and was the right size. 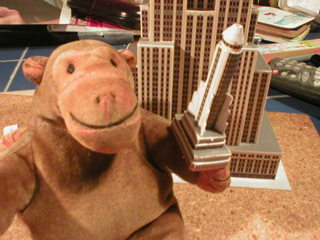 Mr Monkey had to wait until the paint had dried before he could finish his Empire State Building. He didn't want to get silver patches on his orange paws. 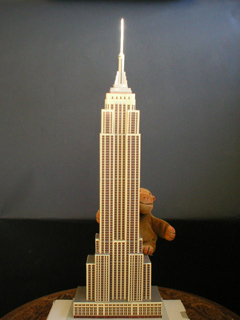 When Mr Monkey had completed his model, he decided the only sensible thing to do with it would be to climb it. He made sure there weren't any U.S. Navy biplanes in the area first, of course. Mr Monkey would like to remind everyone that King Kong would have had a completely different end if the star had been a monkey and not just an big ape. This 1/100th scale model was part of the Guardian's series about great buildings of the 20th century. You can read about them all at the Guardian website.